Doppler Photo: Photos and stories by Omari Stephens: Abscond, v. i. This past weekend, I found and instantaneously purchased a copy of The Devil's Dictionary, by Ambrose Bierce. This makes me very happy. As such, today's story will incorporate random pieces of knowledge from The Dictionary. Enjoy! To "move in a mysterious way," commonly with the property of another. A little over a month ago, I received an email. The preamble to the forwarded message mentioned "keep on the DL" and "crazy" in the same breath. Fantastic. I read through the rest of the mail and immediately decided that, yes, I had to do this. Portrayed above is our fearless leader, mosh. In preparation for the adventure that would take place on Tuesday, 3 February, mosh booked one of Google's conference bikes for the entire morning. Reason: "Teambuilding exercise." A philosophy that denies our knowledge of the Real and affirms our ignorance of the Apparent. 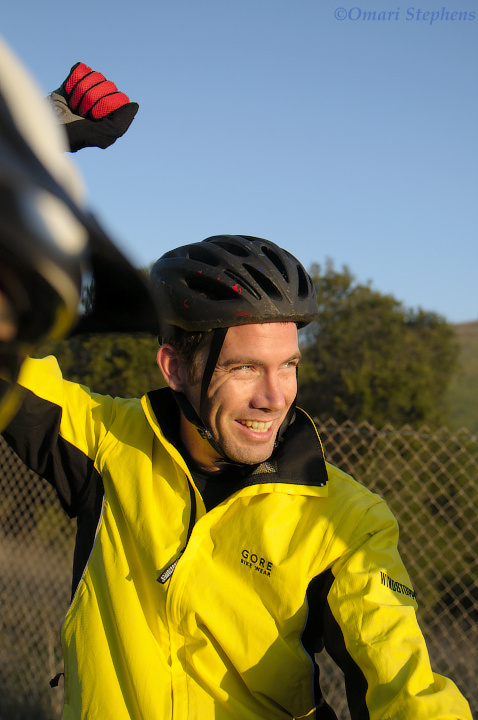 After setting out at the break of dawn Tuesday morning, we rode the conference bike West, away from its home at the Googleplex, and toward Portola Valley and the adjacent hills. The going was reasonable on the flat, but before trying our hands and/or feet at the hills, we first needed to conquer the shallow rises. This was our first shallow rise, and given how hard it was to climb, Donal was well-justified in proclaiming victory as we crested the top. At this point, I was 100% convinced that we wouldn't make it up any real hills. A strip of land along which one may pass from where it is too tiresome to be to where it is futile to go. As with any adventure, this epic bike ride needed documentation. As some friends like to say, "photos/video or it didn't happen." In addition to the 4+ cameras that people brought (including mine), we also had an HD videocamera and a clamp mount. During a break from riding the conference bike, Brett got to use his cyclocross and videography skills in tandem. And the astute among you may recognize this scenery. 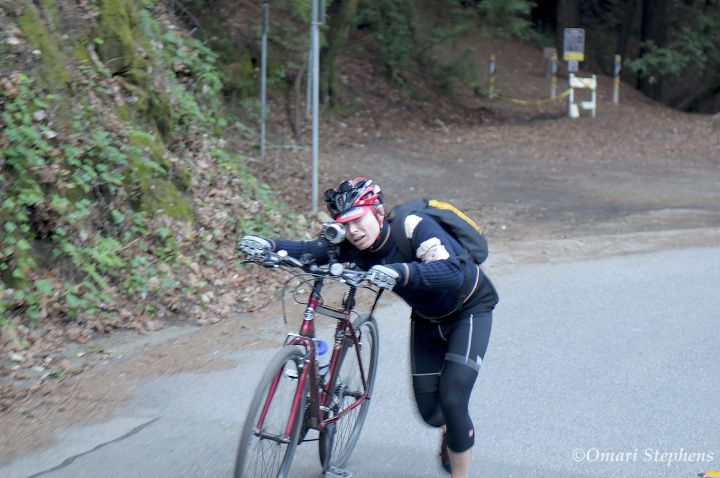 It is none other than Old La Honda, the benchmark climb of the Bay Area. According to a guy at Stanford who seems to know what he's talking about, it's 3.37 miles from the bridge to the stop sign, with an average grade of about 7% and a maximum grade of 15%. An uncomfortable frame of mind that may have a physical basis in something that is being done to the body, or may be purely mental, caused by the good fortune of another. I took a break from riding the conference bike so that ryanpc could get some distance in on the hill before heading back to the Googleplex to do actual work (rather than just work against gravity). While I was off, it was a lot of fun to see the bike lumbering around corners and up the steep bits. This was especially true since, as we found out afterward, the bike has about a 200kg (440lb) curb weight, which the riders have to fight through indomitable quantities of drivetrain friction. Now, this isn't to say the drivetrain was bad. It was actually pretty nifty. But when your pedals drive a chain, which drives some universal joints, which drives another, larger chain, which finally drives a pair of oversized drive wheels, you know there's gotta be some loss in there. And the ~130mm cranks didn't help much. The one unpardonable sin against one's fellows. 1 hour, 6 minutes, including stops. Not too shabby, if I don't say so myself. For comparison's sake, both this page and oral tradition suggest that the record may be just below 15 minutes. But most folks aren't riding the equivalent of 440/6=73 lbs of single-speed, high-resistance sexiness. In fact, we should just call the bike Blue Steel and get it over with. All in all, this was great fun. It's the longest it's ever taken me to ride 30 miles, and it's the shortest distance I've ever ridden in 6 hours. 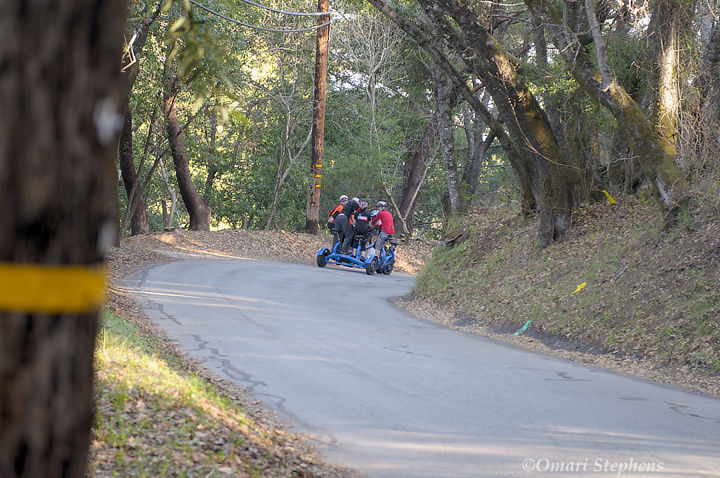 Of course, it's also the most fun I've had on a bike going 28mph.